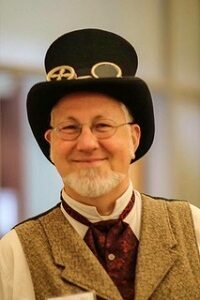 A professional entertainer for four decades, Mark MacDicken performs comedy magic as the eccentric wizard “Flabbergast.” Mark is also an accomplished actor, puppeteer, and balloon sculptor. Formerly known as Spiffy the Clown, he has performed at literally hundreds of family celebrations, as well as theme parks, fairs and festivals, company picnics, summer recreation programs, mall events, and on local television. In recent years, “Flabbergast” has embraced the Mid-Atlantic region fan convention scene, performing at Awesome Con DC, Balticon, MystiCon, Geek Mob, Farpoint, Shore Leave, ConGregate, MarsCon, and adding more appearances all the time! 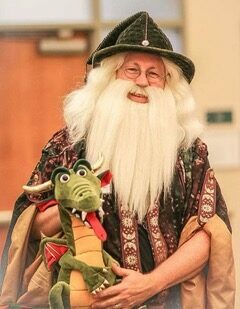 The Wizard and his puppet friends are quickly becoming staples of local Renaissance Faires around Virginia and North Carolina. When he's not dressing up in costumes and playing with his toys, Mark is an elementary school special education teacher. He holds a Bachelor of Fine Arts degree in Drama from the University of Southern California, and a Master of Education degree in Special Education from George Mason University. Mark lives in Northern Virginia with his wife April.